I have gotten several inquiries about cash calendars... here are some answers for everyone to share. Q: What are the important dates? A: Every day in the month of May one ticket will be drawn at random, and that winner will receive some amount of cash for that day. Drawings start May 1 (This Friday) and end May 31. Q: Is it too late to purchase tickets? A: It is not too late to purchase tickets. You will have another opportunity to submit tickets for the Mother's Day drawing (whopping $150 prize) on Sunday. If you purchase tickets that day at the field, those tickets will be submitted for the Sunday drawing. We will have a stand setup at pine banks to collect the tickets. Q: What do I do with my unsold stubs? If you have stubs that you will not be able to sell, please bring them to the stand at pine banks on Sunday. I hope everybody had a great first week last Sunday. I would love to hear about how it went for your young athlete in the comments below. 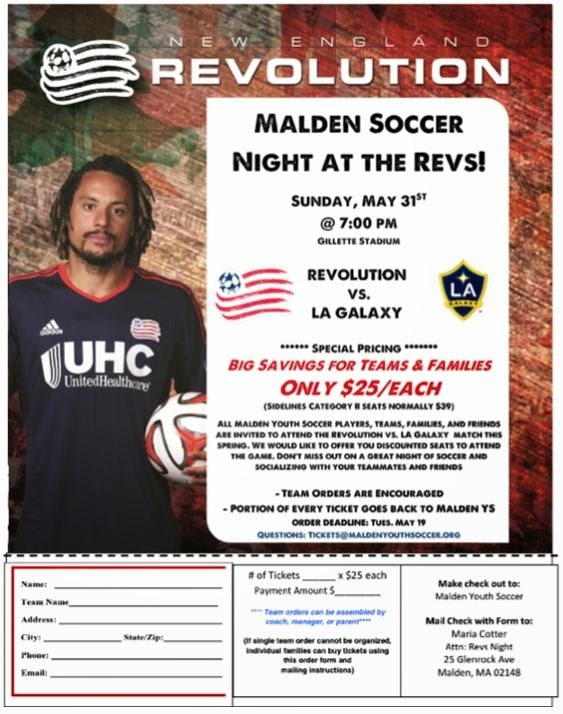 Join us for Malden Youth Soccer's NE Revolution night on May 31. Be sure purchase your cash calendars from your coach this weekend. Each player is asked to buy and or sell 3 calendars for $10/each. See your coach if you have not received your pack. We WILL have soccer on Mother's day! 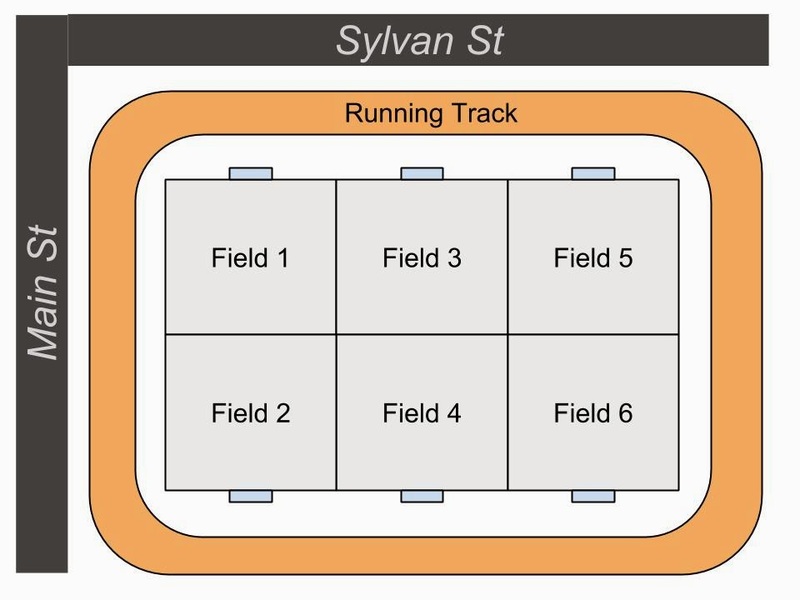 But, due to a Melrose Road Race that day, we will use the back field at Pine Banks. Participating coaches can download this week's prepared practice card. 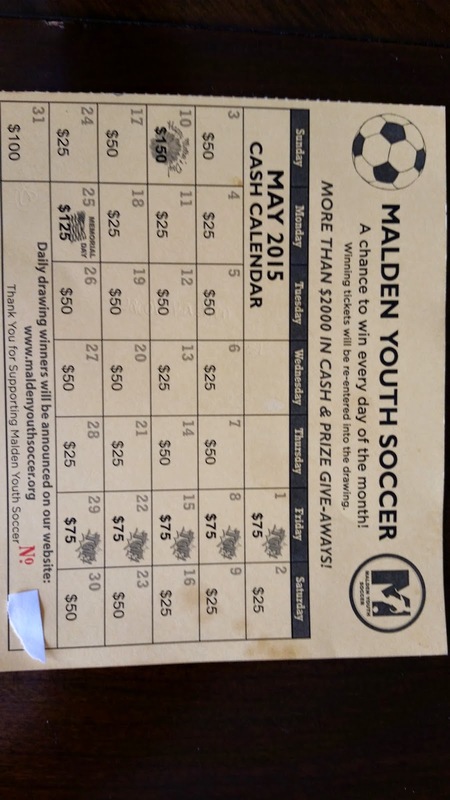 Malden Youth Soccer is getting a great deal on New England Revolution tickets on May 31st. The flyer below tells you how to get them. The deadline for ordering is May 19th, but be sure to get your order in before that date if you want to guarantee your tickets at our price. Spring 2015 - Week 1 is Here! We're starting a new soccer season this Sunday. This is the first U7 Spring session, and thanks to 24 generous volunteer coaches, we're able to support 12 teams at the U7 level! We can accomodate a few more players, so please help spread the word that players can still register online. These positions will be taken quickly. If you have not yet committed it to memory, please be sure to read through the spring welcome letter. There are important things you need to have for the first day... read the full post... but especially remember that every player must bring their own size 3 soccer ball AND soccer shin guards. Striking the ball with the inside of the foot by way of old-fashioned passing. 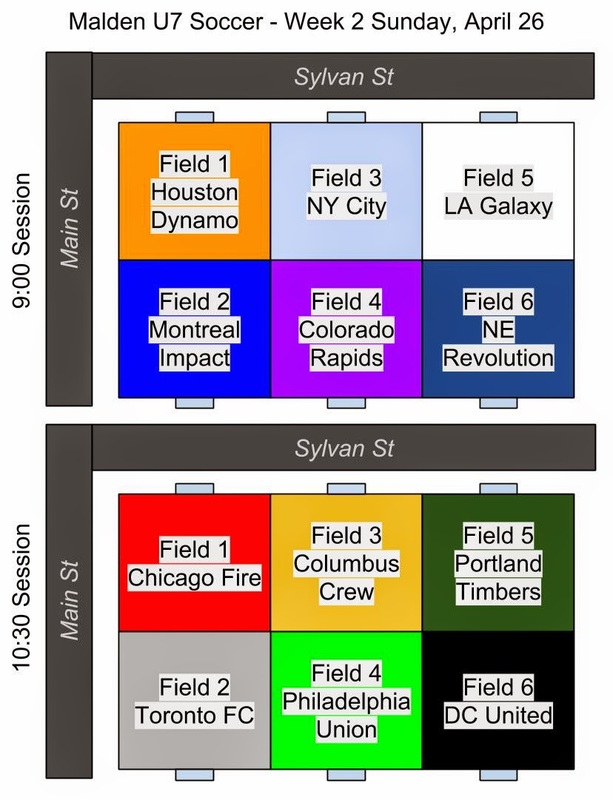 Here are the field assignments for this Sunday. For coaches participating with the optional pre-planned practices, here's this week's card. What a winter, huh? Spring seems to be just about here. We're kicking off the spring season just 2 weeks from today. This page should help you prepare for the start of the season. You should be receiving an email with your child's team assignment within the next few days. If you have already registered, contact the league if you don't get it by April 11. If you have friends or family who might be interested, let them know asap before we fill up! Due to the impact of our winter storms, we have had to alter our schedule a bit from the normal spring season. Our season starts on April 19 and will run for 9 consecutive weeks with no break for Memorial Day. The last game will be June 14th. We will have our annual league banquet at some point in the week after our last game on June 14. Details will be announced when we get closer to the date. All of our games this season will be on Sunday mornings. We will have 2 time slots that will changes for each team every day. The first slot is 9:00-10:25. The second is 10:30-11:55. Each 85 minute time slot will be divided into a 40 minute skills/drills session and a 40 minute scrimmage/game, with a 5 minute break in between. This Blog will be the primary source of information for schedules, cancellations, etc. Please bookmark it. Feel free to use the comments to discuss the league and let us know what we can do to improve any aspect of U7 Soccer. For this outdoor session we will play 5v5 plus a goalie. We will use the bigger nets. 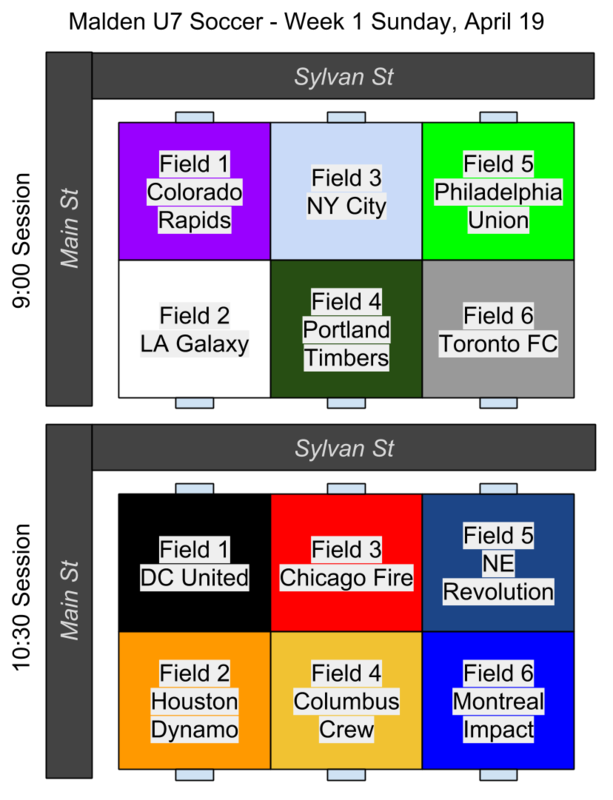 Coaches may decide to change the structure as needed for a fun and fulfilling game depending on attendance. Coaches may decide to balance teams at game time if there is a need to equalize the number of players on each team. We will play with throw-ins, goal kicks and corner kicks. Be sure to note the time you play each week!